Cat Tales and Paper Trails: I seriously love this stamp. I seriously love this stamp. Sometimes something so simple can have such enormous potential. 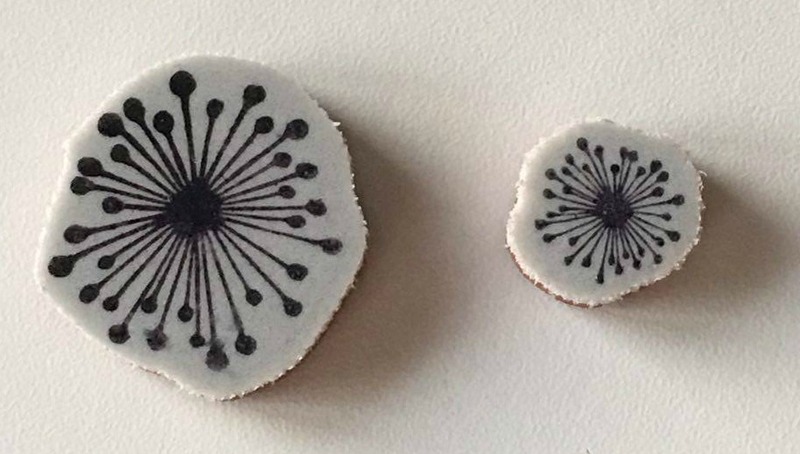 Like these stamps: Spray and Mini Spray from So Suzy Stamps. I started with a 1/4 sheet of Fabriano Hot Press 90# watercolor paper and used Spiced Marmalade, Carved Pumpkin, Broken China and Salty Ocean Distress Inks to create a background with my blending tools. I love the contrast of the blues and orange together. I added a "ground" of Black Soot Distress Ink to the lower corner right over my blue. With a C9 Copic marker I quickly sketched in some stems, leaves and grasses. 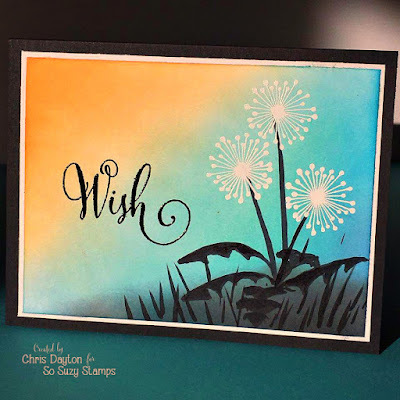 I used my MISTI to first stamp the Wish sentiment in Versafine Onyx Black ink, then a second time with Versamark ink and heat embossed with Gina K clear embossing powder. I used a stamp block to stamp the three "puffs" with Versamark and embossed with Filagree white embossing powder. I then trimmed the edges by 3/16" on each side, and matted with a white mat onto a black card base. 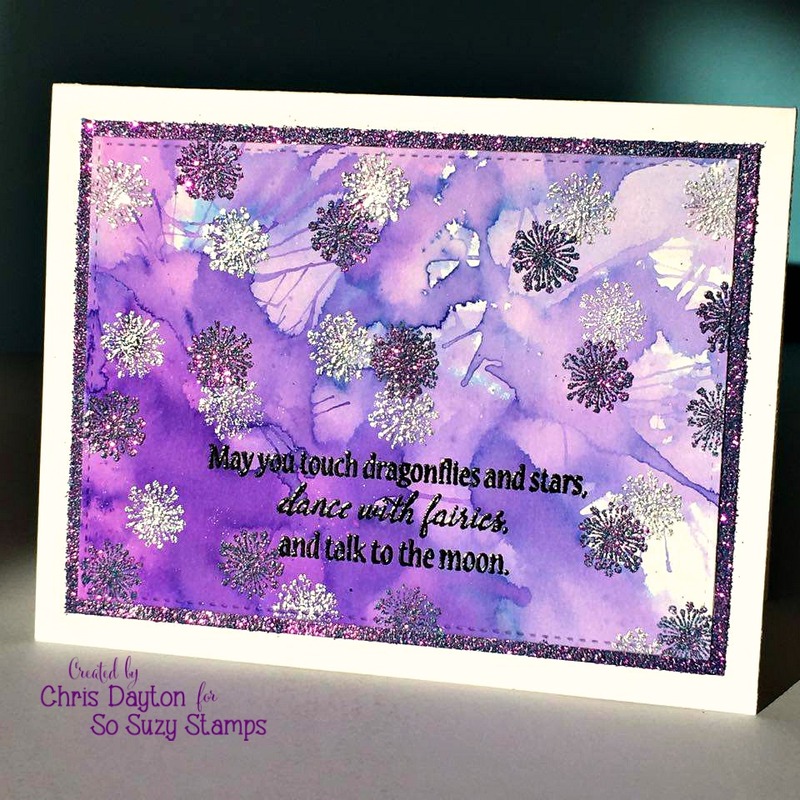 I also used heat embossing with this next card using the Mini Spray stamp to create a magical background of mini fireworks. 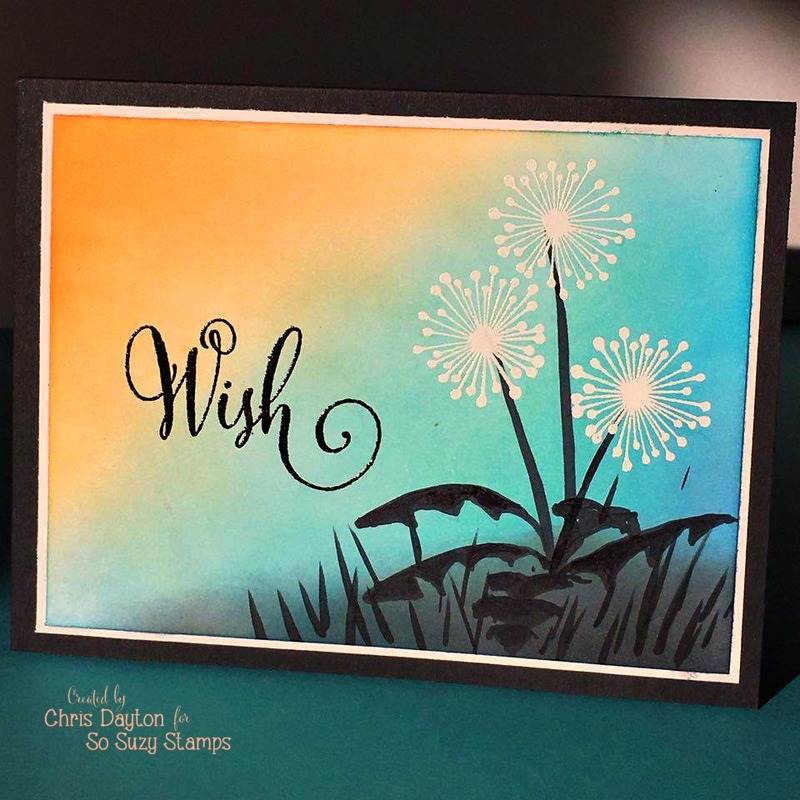 For this card, I began a sheet of smooth-textured Bristol 300 paper. I added tiny amounts of Indigo, Alizarin Crimson and Violet Colorburst powders in three separate areas on my paper. I then spritzed the paper with water and let the powders dissolve for 20-30 seconds before using a this straw to blow the colors together, apart and across the page until I was satisfied with the pattern of color. The colors blended into a warm purple. and left a fun textured look. I let my paper completely dry before stamping the Talk to the Moon stamp in Versafine, then Versamark and heat embossing with clear embossing powder. I used a stamp block to add a pattern of 8-10 Mini Sprays across my card in Versamark. I heat embossed those using Wow! Silver Hologram embossing powder. I only did one side of the card and heat embossed it, then did the same with the other side, to make sure I could get the powder on before my ink began to dry. 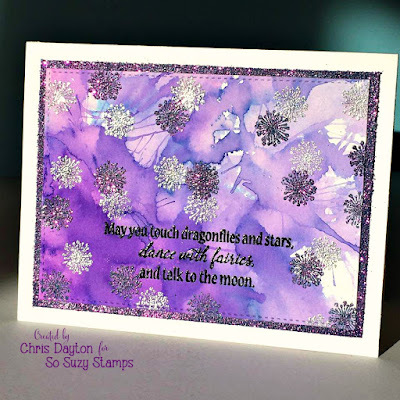 Once I had heat set the silver powders, I repeated the same process, this time embossing with Wow! Persian Indigo powder. Both of these powders have such a fabulous sparkle. I trimmed my Bristol panel using one of the stitched rectangle dies from The Ton Stamps. I cut a lightweight white mat just larger than my focal panel, and swiping my embossing ink pad on the edges, then using the same Persian Indigo embossing powder made my own matching paper to mat with. I assembled the layers onto a white card base. Thanks for stopping by! Have a wonderful week! Every time I see a card I think, I wish I'd bought that stamp! Beautiful cards. Absolutely lovely. Brilliant projects Chris! I love that background...AAAAHHHHHMAAAZZZZINNNNG!! !